An elegant wedding dress is one of the things that helps to accentuate how beautiful the bride is. 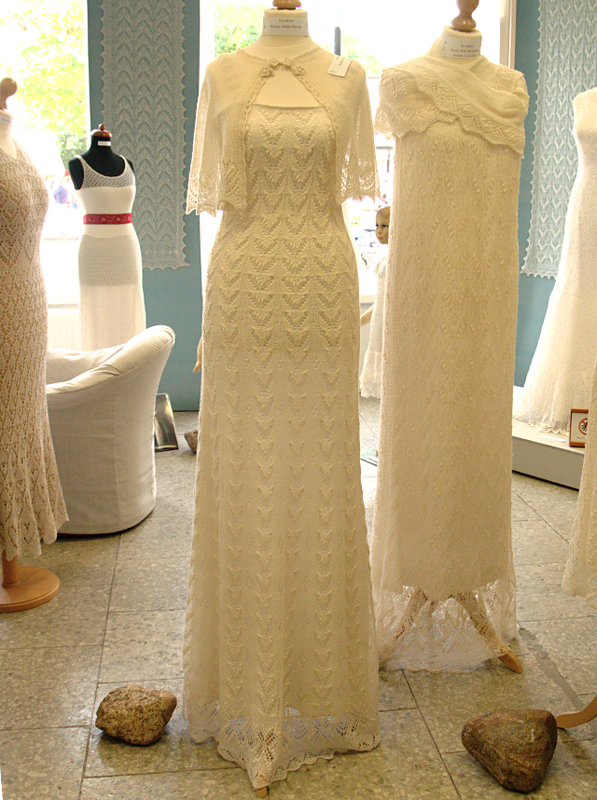 To me knitted wedding dresses are the most elegant ones of them all. I have not yet had the honor to knit one but luckily there are plenty of other talented knitters who have. 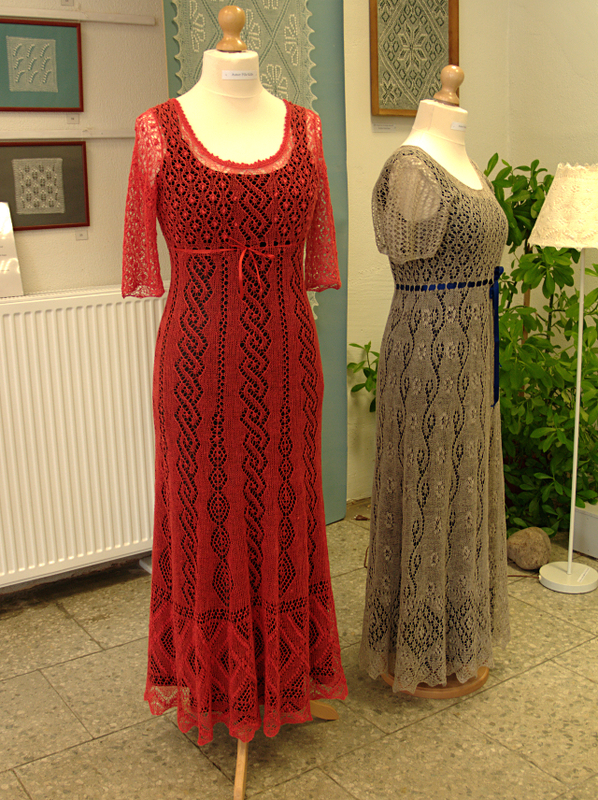 The dress on the left is knitted by Ege Paju, to see the whole dress scroll down a bit. 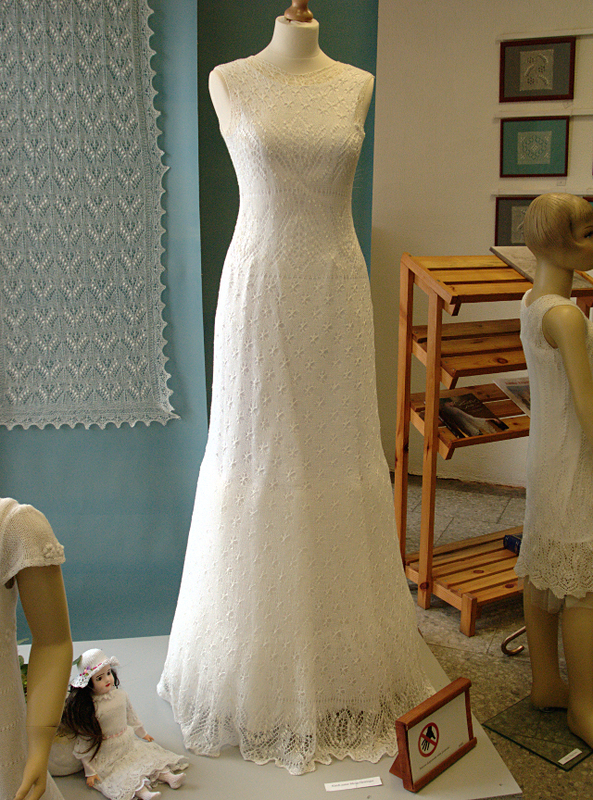 This last lace wedding dress was knitted by Ester-Vileida Viilup in 1974. At first the dress was white with pink underdress, but after the wedding it was colored so that it could be used for other occasions. 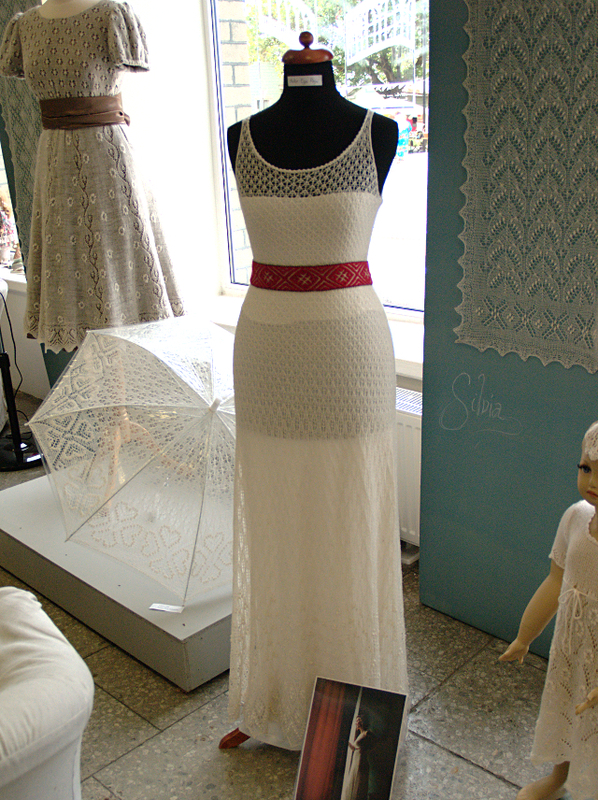 As you could see from the pictures there is lot more to see in the Haapsalu Lace Centre than knitted wedding dresses. I do have some more pictures that I want to show you in my next post but even after these there is still a lot to see and they constantly add new items to their exhibition. 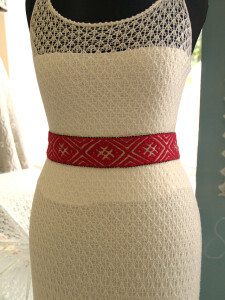 So if you like lace and visit Estonia then you definately have to go there! Have you heard of the saying “the shoemaker’s children always go barefoot”, this was the situation where I found myself at the beginning of summer. I didn’t have any summer dresses to wear! 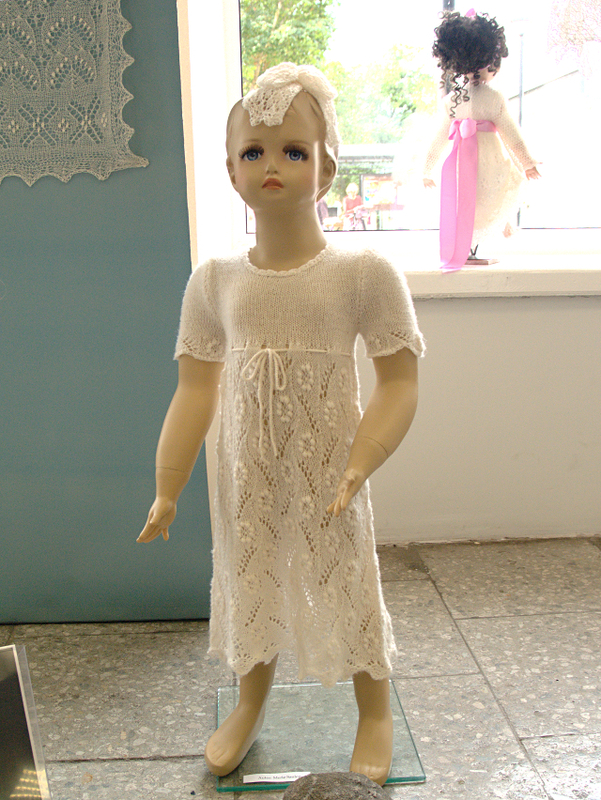 As I have always dreamed about knitting a lace wedding dress in the future this presented me with the perfect opportunity to get some hands on experience in knitting dresses. There were two things to decide, the yarn and the pattern. 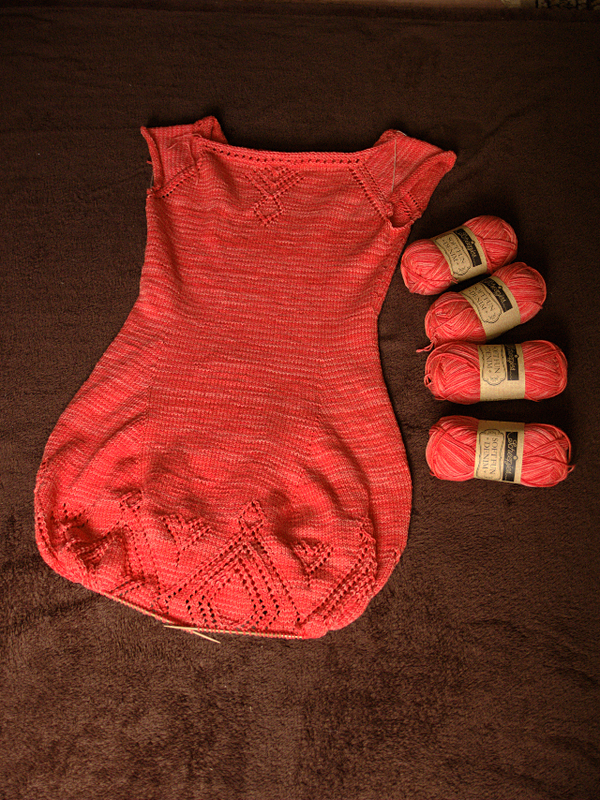 As it was going to be a summer dress then I didn’t choose a woolen yarn but Scheepjes’ Soft Fun Denim that has 60% cotton and 40% acrylic, 50g – 140m. 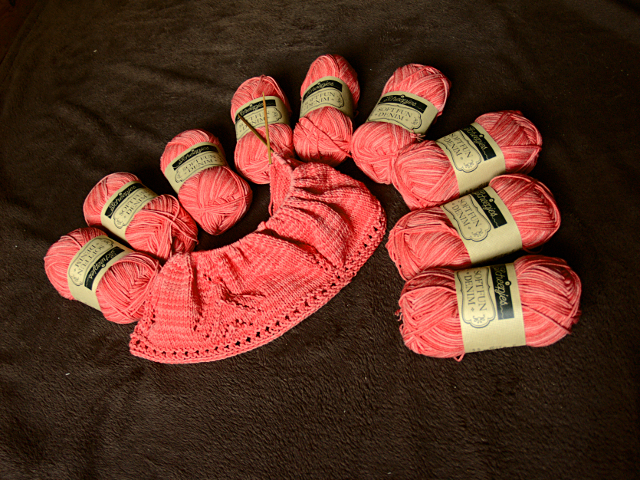 The color was difficult to choose because so many of them were beautiful, but I finally decided on kind of reddish pink. 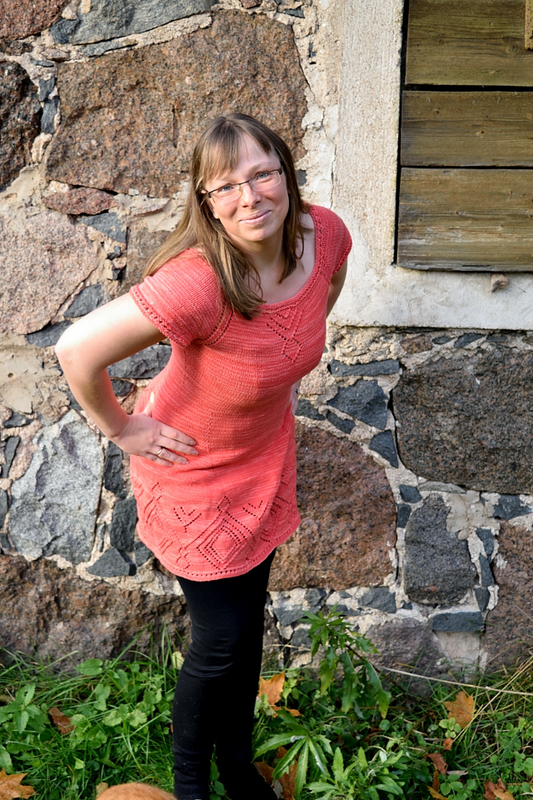 While looking for summer dress patterns I found myself on the Drops design page and fell in love with the Summer Feeling Dress and it seemed to be a good dress for a first dress to knit. I was a bit worried that the 500g of yarn I had wasn’t going to be enough but in the end it took exactly 350g of yarn so the dress is also light to wear. 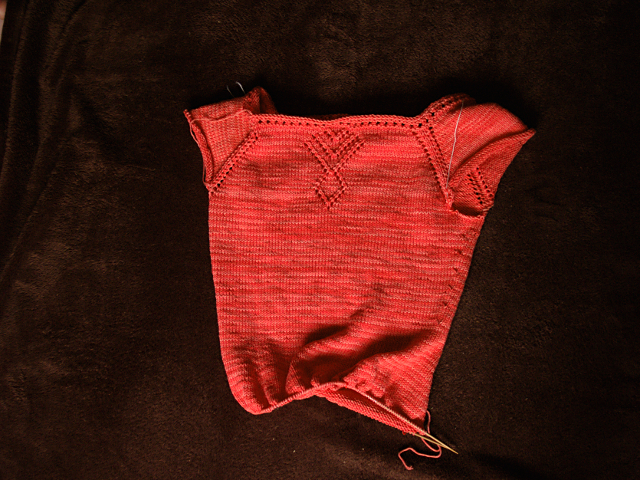 I took pictures after I knitted every 50 grams so you can see how the dress took shape. 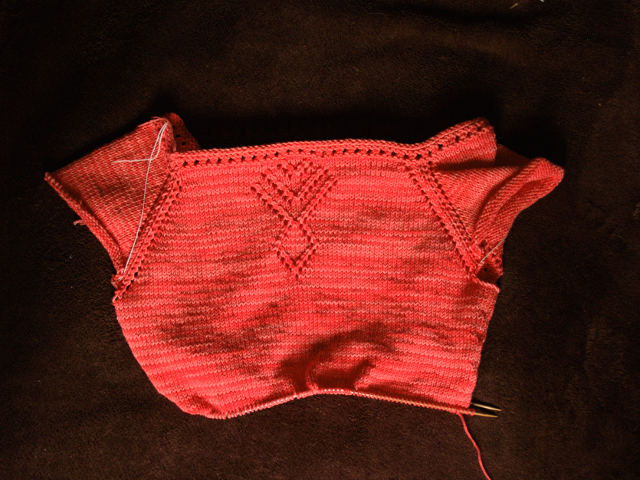 This was also the first time for me to start from the shoulders and knit down from there so I was pretty exited to see how the tress would end up. 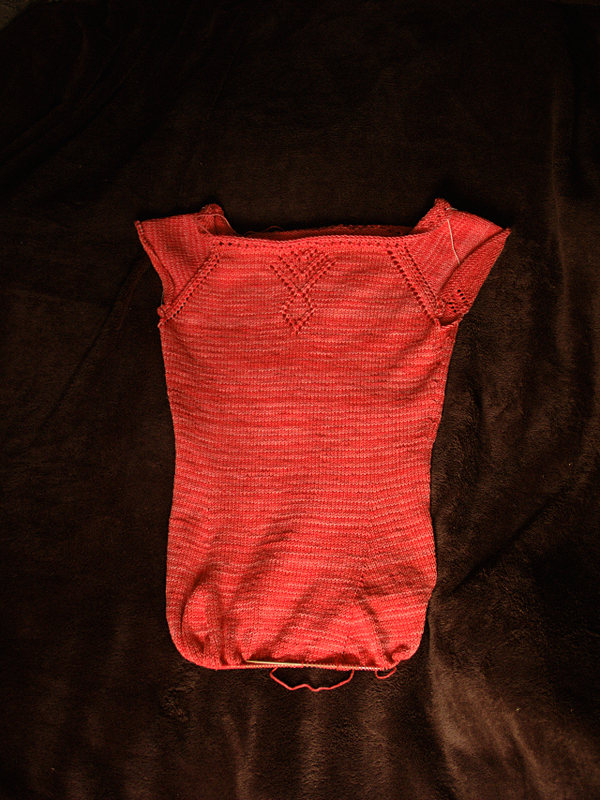 And I’m very happy with it and will wear it a lot this summer (if the weather permits it). 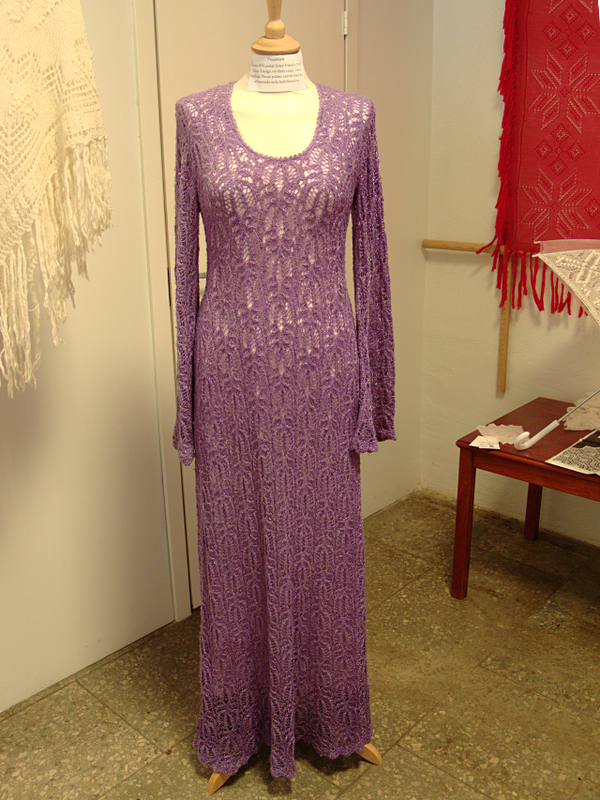 The only problem is that when I’m wearing it then it is very hard to take pictures of the dress. My husband took about twenty and only a few were normal, on all the others there was an optical illusion where there appeared to be lines on the dress that are not actually there (maybe you have seen sometimes roof tiles can do the same on a picture). Hi! I'm Aili - a wife, mother of three and a knitter. 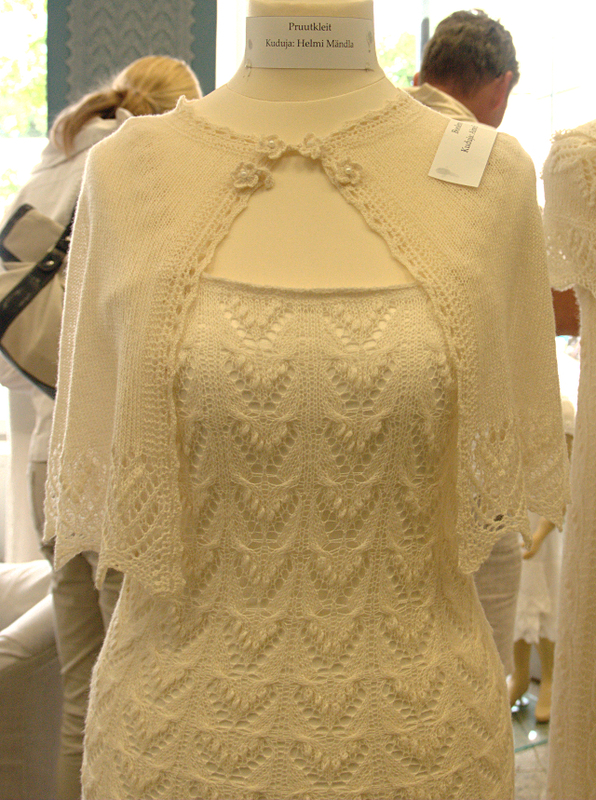 I have been knitting since I was five years old and some time ago I fell in love with lace knitting. 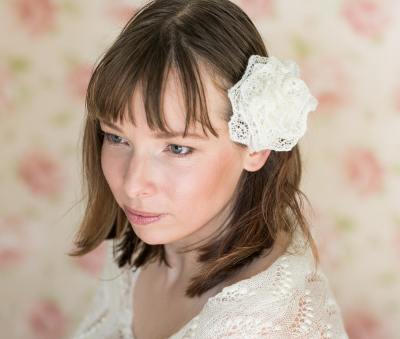 Here you can find my wedding knits blog and shop. Please feel free to contact me. Copyright © 2019 Artanis Wedding Lace All Rights Reserved.